Here I am in one of my favorite thrift finds of late! This suede jacket reminds me of a jacket that belongs to my dad - it's also from the '70s and suede and I wore it in high school, even though it was way too big (well, it was the '90s!). Did you check out my blog giveaway? It's now updated with a video of the clutches! FANTASTIC jacket!! Such a great color. ohh I love love love the jacket !! Love that last pic, it's looks like it's from a magazine! blue with orange is one of the most striking color combos ever. I love this jacket, and you look amazing in burnt orange...that coat in Chicago haha..you'll have hypothermia! AHHH Maryann I want winter to be over now. Hey! 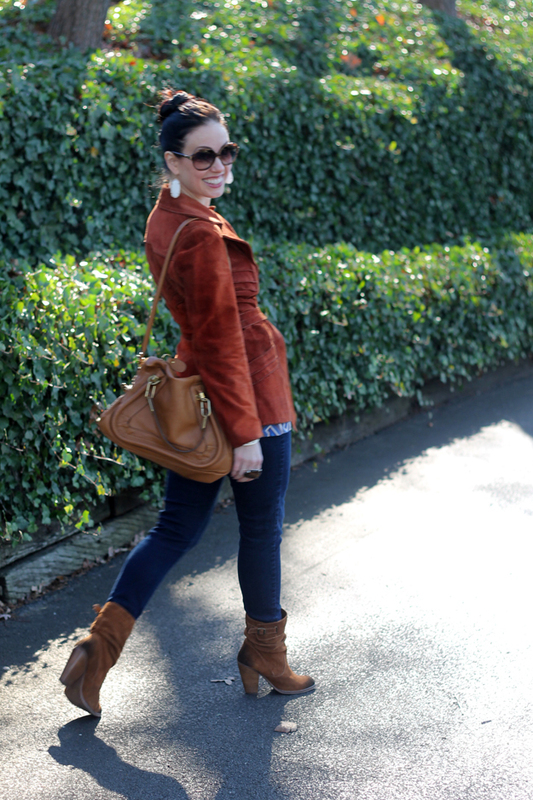 Thanks for stopping by to see me :) Adore the colour of your jacket & especially love your boots & bag! Would love to have you as a follower & I'm happy to follow you back. Beautiful look and colors, gorgeous jacket and its material! So lovely!!! oh wow, a great outfit! Of course I love the bag, but also the boots and and top are great! a wonderful combination! 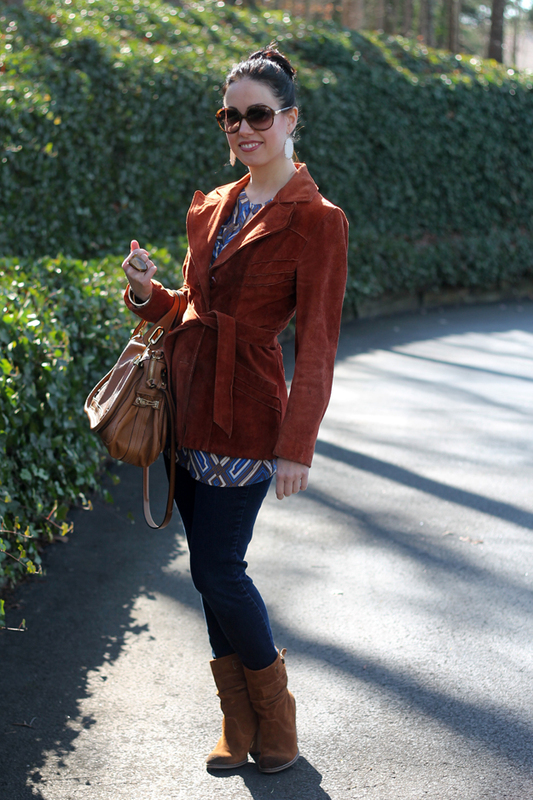 Oooooh, suede jacket love! It looks gorgeous on you. I'm such a sucker for suede/leather jackets. I actually have a jacket that is very, very similar, except it's in regular brown leather, not suede. I saw that yours is vintage and was wondering if it still has a tag in it. Mine was my mom's, and it is the first thing she bought with her own money that she earned at her very first job during high school. Also loving the sunglasses! You have excellent taste--I've been debating buying some similar Chloe ones recently =). What an amazing jacket. It looks great with the patterned blouse. i love your ring too!